I love French Bread Pizza—but, I think the rest of my family could take it or leave it. Usual French Bread pizzas have too much crust—too much crunchy bread and not enough toppings for the husband and the kids. 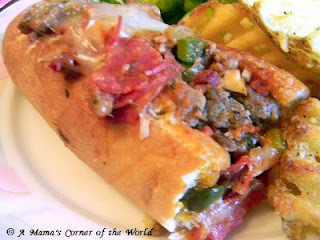 With this Pizza Stuffed French Bread Sandwich recipe I was able to build my favorite pizza flavors—and the French Bread crunch--but take away some of the crunchy bread so that even the little people in the house love it. Cook the meat. Crumble the sausage and ground turkey into a frying pan. Cook over medium heat until meat is cooked through. Remove with a slotted spoon and set aside—keeping warm. Saute the vegetables. In the skillet, add the butter and olive oil to the meat drippings. If you used pork sausage or ground beef—remove all but about a tablespoon of drippings before adding the additional fat. Cook the onions and green peppers until both are softened and the onion becomes translucent—about 3-5 minutes. Add the garlic, salt, pepper and Italian Seasoning. Cook an additional 2 minutes. Combine the sandwich filling. If the skillet is large enough, return the meat to the vegetable mixture and add the pasta sauce. Stir to combine. Reduce heat to a low and simmer the sandwich filling over low heat for 10 minutes. Add the Parmesan cheese and stir to combine. If the skillet is too small--simply transfer the filling to a large saucepan to simmer. Prepare the French Bread and preheat the oven. Preheat the oven to 350 F. Cut pockets into the tops of the French bread—leaving about ¾ inch of bread around the edge. Cut about 2/3 of the way down into the bread loaf and remove the cut strip from the center of the bread. This will create a pocket to hold the sandwich filling. I like to use the cut out bread, chopped into bite sized cubes, in salads instead of croutons. Stuff the French bread sandwich. Divide the sandwich filling between the two sandwiches and fill the pockets. Sprinkle with the mozzarella or Italian shredded cheese. Wrap the pizza topping, stuffed sandwiches in aluminum foil and bake. Lightly spray two large rectangles of aluminum foil with cooking spray. Carefully place each sandwich onto the foil rectangle and wrap up by crimping the foil across the top and at the ends. Bake for 10-15 minutes or until cheese is melted and sandwich begins to brown. Cut and serve. Cut each stuffed French bread loaf in half—making four sandwiches—or into thirds or fourths for smaller, kid friendly sandwiches. We serve with salad and fruit or alongside a green vegetable and fries.